Of course, attempts to describe a complex community structure by one single attribute, such as richness, diversity or equitabil-ity, can be criticized because so much valuable information is lost. A more complete picture of the distribution of species abundances in a community makes use of the full array of Pi values by plotting Pi against rank. 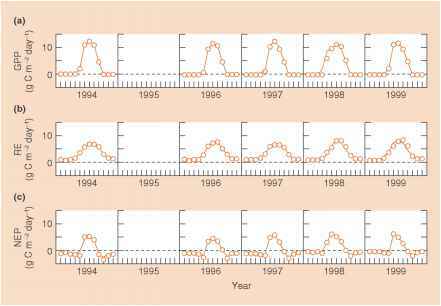 Thus, the Pi for the most abundant species is plotted first, then the next most common, and so on until the array is completed by the rarest species of all. 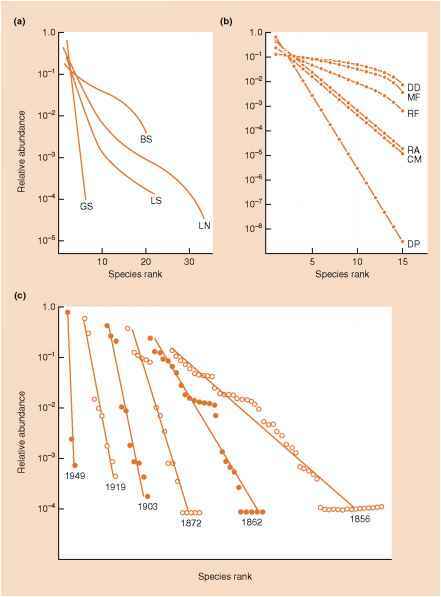 A rank-abundance diagram can be drawn for the number of individuals, or for the area of ground covered by different sessile species, or for the biomass contributed to a community by the various species. A range of the many equations that have been fitted to rank-abundance rank-abundance diagrams is shown in Figure 16.5. (the log series and log-normal) with no biological arguments foundation in any assumptions about how the species may interact with one another. The others take some account of the relationships between the conditions, resources and species-abundance patterns (niche-orientated models) and are more likely to help us understand the mechanisms underlying community organization (Tokeshi, 1993). We illustrate the diversity of approaches by describing the basis of four of Tokeshi's niche-orientated models (see Tokeshi, 1993, for a complete treatment). The dominance-preemption model, which produces the least equitable species distribution, has successive species preempting a dominant portion (50% or more) of the remaining niche space; the first, most dominant species takes more than 50% of the total niche space, the next more than 50% of what remains, and so on. A somewhat more equitable distribution is represented by the random fraction model, in which successive species invade and take over an arbitrary portion of the niche space of any species previously present. In this case, irrespective of their dominance status, all species are subjected to niche division with equal probability. The MacArthur fraction model, on the other hand, assumes that species with larger niches are more likely to be invaded by new species; this results in a more equitable distribution than the random fraction model. Finally, the dominance-decay model is the inverse of the dominance-preemption model, in that the largest niche in an existing assemblage is always subject to a subsequent (random) division. Thus, in this model the next invading species is supposed to colonize the niche space of the species currently most abundant, yielding the most equitable species abundances of all the models. glass slides in a lake, change from a log-normal to a geometric pattern as the biofilm ages. Taxonomic composition and species diversity are just two of many possible ways of describing a community. Another alternative (not necessarily better but quite different) is to describe communities and ecosystems in terms of their standing crop and the rate of production of biomass by plants, and its use and conversion by heterotrophic microorganisms and animals. Studies that are orientated in this way may begin by describing the food web, and then define the biomasses at each trophic level and the flow of energy and matter from the physical environment through the living organisms and back to the physical environment. Such an approach can allow patterns to be detected amongst communities and ecosystems that may have no taxonomic features in common. This approach will be discussed in Chapters 17 and 18. Much recent research effort has been devoted to understanding the link between species richness and ecosystem functioning (productivity, decomposition and nutrient dynamics). Understanding the role of species richness in ecosystem processes has particular significance for how humans respond to biodiversity loss. We discuss this important topic in Section 21.7. How to do a rank abundance diagram?